Mostly I've been dreaming about making stuff. I dream about how I'm going to make something. All those projects that I have tucked away in my my sub-conscience come out to play when I sleep. If my dreams come true, I'll have some cool projects to show you before Christmas. 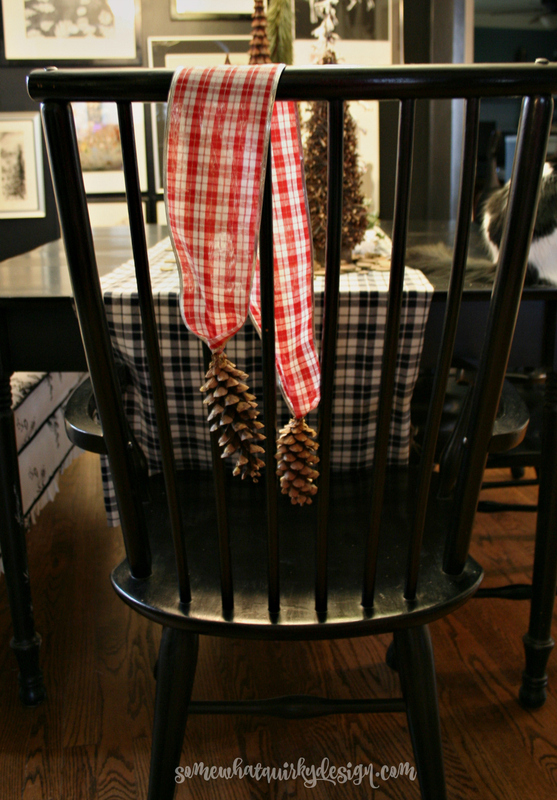 The other day I made these cute little pine cone chair hangy things. I wanted them to look like this . . .
. . . ever so casually draped over the top of the chair. 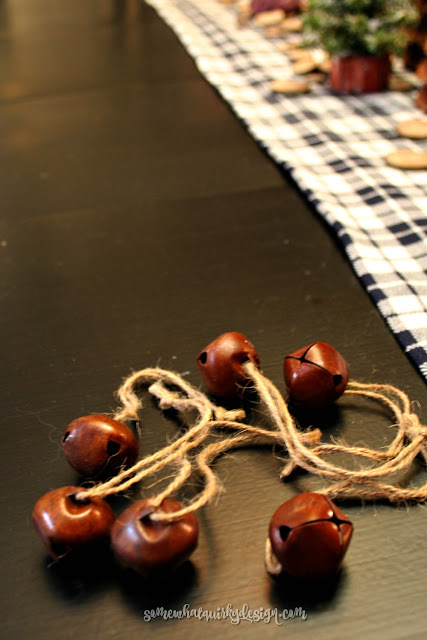 They tended to look more like this . . . I had to fix that. But first let me show you how I made them. 1. 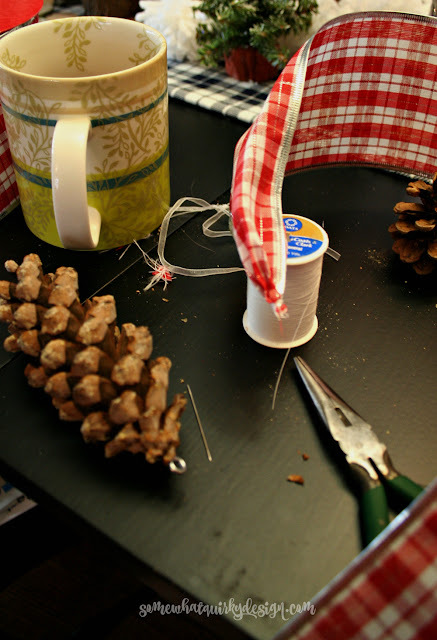 Put a small screw eye into the base of the pine cone. 2. 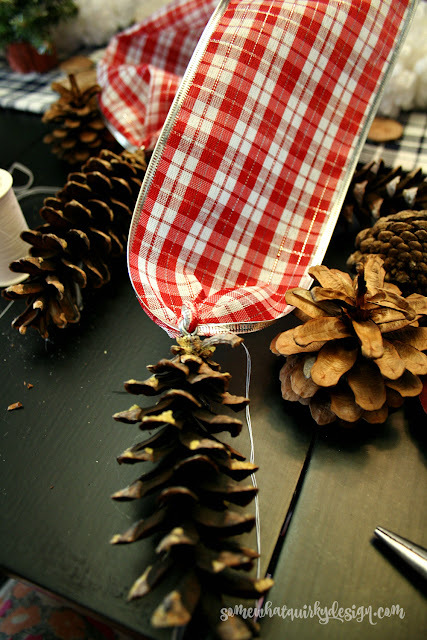 Loosely gather the end of your ribbon with needle and thread and before you cut the thread wrap the thread tightly around about 1/2 inch of the ribbon. No your vision is not bad. These pictures are horribly blurry. I must have had too much coffee the morning I made these! 3. 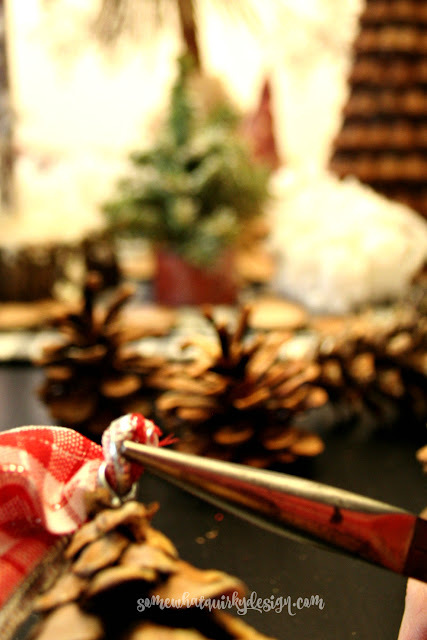 Push the tip of the ribbon through the eye screw and pull through with needle nosed pliers. 5. 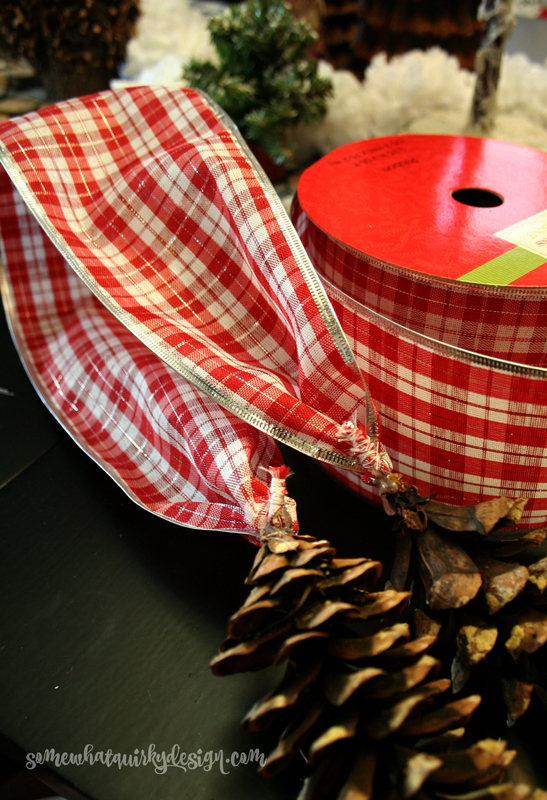 Do this to each end of the ribbon. Note: feed the gathered tips through the eye one in reverse of the other - so that when you lay it over the chair both pretty sides will face out from the chair - towards the viewer. 6. 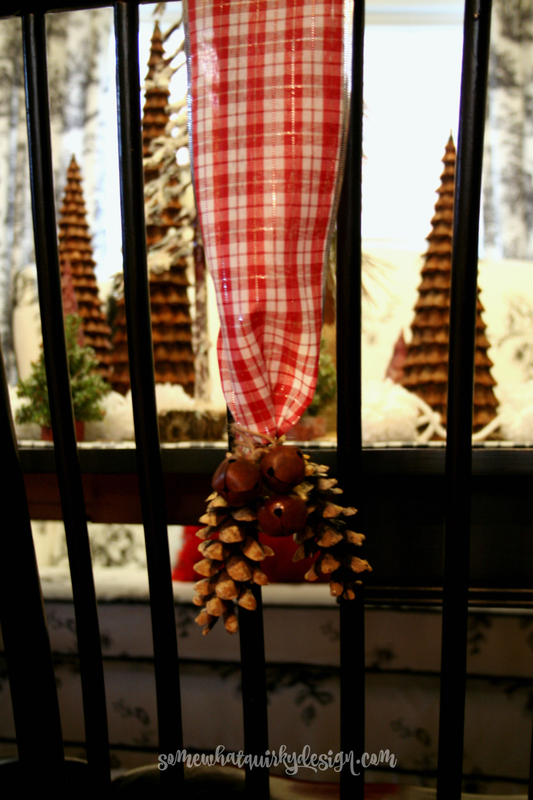 Then because I had to do something to keep them in place I took some of my jingle bells and wrapped three of them around the ribbon, right above the pine cones. They go perfectly with the tablescape and the new wreaths I made. 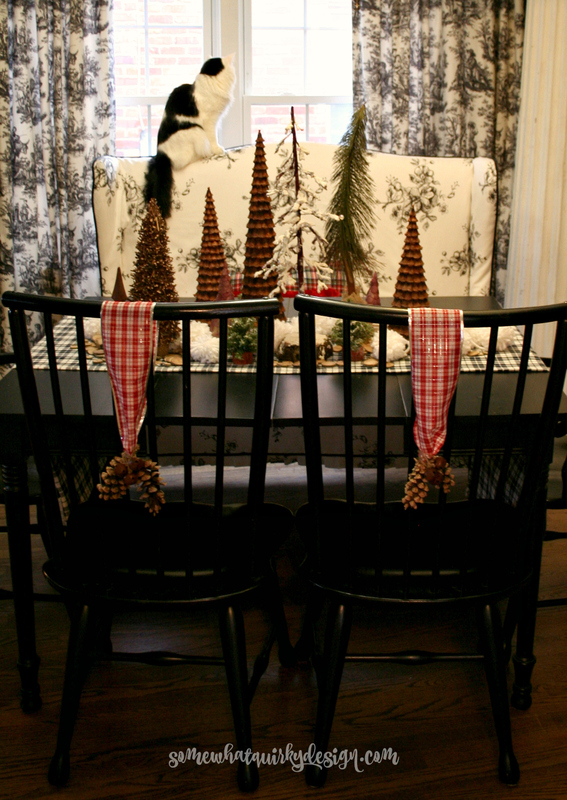 But decorated chairs are always 23rd on my list of things to do. Look at me, all on top of things! 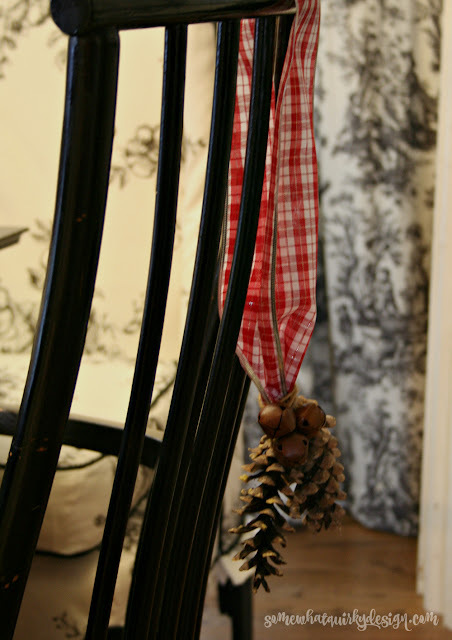 Did you decorate your chairs? Do you like chair decor? I love the pinecone and bell chair ornament idea. I also love that cat, he/she is adorable!!! Love, Love, Love your pine cone chair hangings!! Such a great idea. 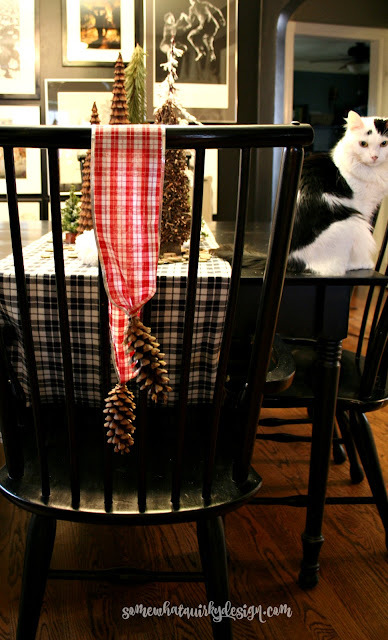 I love hanging things on the chairs at Christmas and like doing something different each year. I might just give your pinecones a try next year.